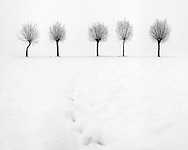 Black and White Landscape Photography selection of Italy, France and other European countries. Alps, winter scenes, gliacial lakes, countryside enchanted sceneries, moody atmospheres. All images available as fine art prints and for licensing as rights managed stock photos.